ORLANDO — Ringling Bros. and Barnum & Bailey’s newest circus show “Built To Amaze!” stays true to their roots while putting a fresh spin on family entertainment. This show kicked off in Tampa last week, and the Amway Center in Orlando marks the second stop on a 90-city North American Tour. Despite the recent start, the pieces of this live production are already running in perfect harmony. Circus fans young and old are sure to be amazed by what this latest Ringling Bros. installment has to offer. “‘Ringling Bros. Presents Built To Amaze!’ is a blast of excitement created in a fun way of girls versus boys that will leave audiences cheering for their favorite performers,” says show producer Nicole Feld in a statement released by Ringling. And this girls vs. boys competition plays a vital role during the show as the audience sees the circus come to life. If you weren’t already expecting to be wowed by the animals that make up this production, “Built To Amaze!” doesn’t waste a moment by grabbing your attention from the start. 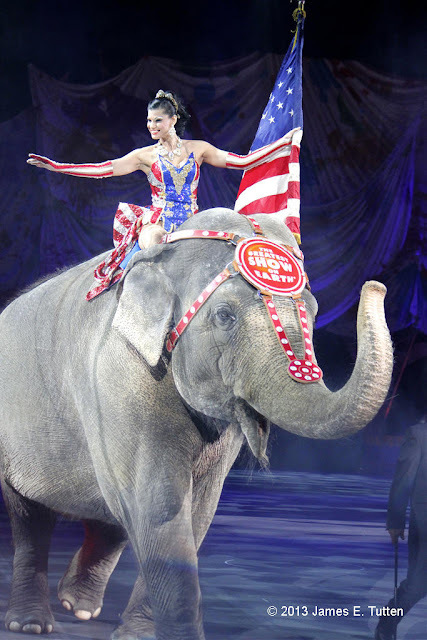 Ringmaster Andre McClain says a few words to get things started and begins singing the national anthem, as a king-sized elephant parades around the floor with an American flag waving beauty sitting atop the impressive pachyderm. We see the contest between the “Ringling Girls and Barnum B-Boys” near the middle part of the first act. Each group has a chance to shine and prove who’s got the best to offer the circus. Soon the ultimate message is made clear as we find that both groups can achieve great things when they learn to work together. 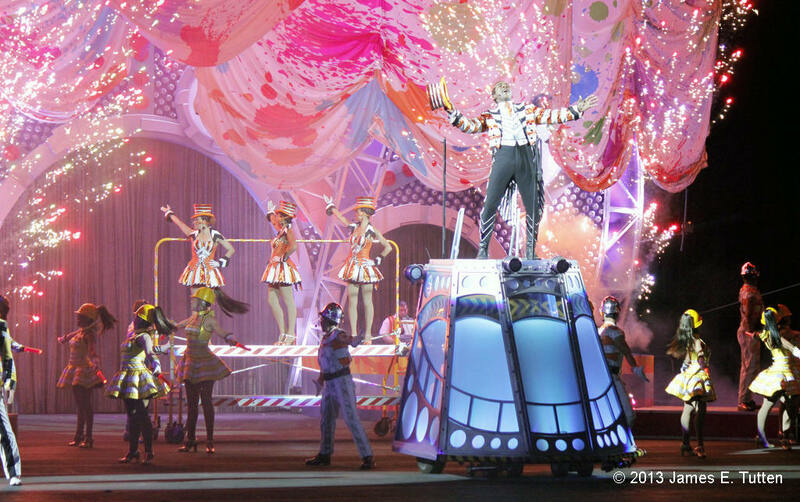 That seems to be the primary theme for this show, where they have to start from scratch to make “The Greatest Show On Earth,” and can only get there through teamwork. With 110 incredible performers from around the world and over 90 exotic beasts in all shapes and sizes, it’s a lot to bring together under one roof. It’s easy to get distracted by all of the activity on stage, as there’s a lot to take in at all times. This is a live experience where, even after watching the show several times, you can still catch something that you didn’t see before. “We love coming out to the circus, it’s a lot of fun. My oldest looks forward to it every year,” said Jennifer Burg. Her family has come out to see Ringling Bros. shows for the last three years and they are always impressed with the talent on display. There are several new acts that were added to this installment of Ringling, including Alex and Irina Emeling, who have won nine international comedy awards with the help of their specially trained pack of performing poodles. And a group of basketball players from New York City called the King Charles Troupe rides atop unicycles of varying heights as they spin, shoot and slum dunk around each other. Seemingly the most dangerous part of this production for the audience is when Tabayara “Taba” Maluenda enters the tiger arena. If you don’t look away in fear you risk your eyes drying out due to lack of blinking as this fiery daredevil faces down 18 full-sized tigers in an enclosed space. Maluenda controls the movements of these great beasts with a precision and confidence that is almost impossible to believe. “I thought the entire show was great and my kids had a blast, I have to say the man with the tigers was incredible,” said audience member Jason Mills. Will all the expert refinement put into this production, “Built To Amaze!” will surely amaze all who come out to experience its wonder. Generations of circus tradition has created a show that defines delight and remains remarkable. Elephant parading at the start of Ringling Bros. show "Built To Amaze!" in Orlando.